View current collections below. Click an image or link for a full description. Collected material, including periodicals and ephemera, created by revolutionary groups in Mexico between 1965 and 1998. Bear Facts was the newsletter published by the Oceanids, a service and social organization promoting friendship and services to the UC San Diego community. 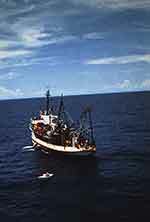 A collection of diverse resources about the ocean and ocean exploration. Images by Theodor Seuss Geisel digitized from originals in the UC San Diego collections. Political cartoons drawn for the New York newspaper PM by author and illustrator Theodor Seuss Geisel.